For the last three years, Hamed Haddadi has been quietly rampaging across a number of different Chinese frontcourts. However, it may not be a quiet occupation for too much longer. Now in Sichuan, Haddadi has spent the first three games of the new season putting up solid numbers. Right now he’s chalking up 17.7 points, 16.7 rebounds, 4.0 assists and 1.7 blocks a game. He’s also perhaps the best center in China. That Haddadi is excelling should surprise no-one. At 7″1 and 260lbs, the big man is physically stronger and more complete than most centers in the league, particularly those with Chinese passports. Last season, he should have been an MVP candidate after playing a big role getting an unfancied Qingdao side all the way to the CBA Semi-Finals whilst averaging 20.4 + 13.9. His coach then was Li Quipeng, the former mentor of Yao Ming and a man who certainly knows what to do with his big men. Critically, this season Haddadi has linked up with Yang Xuefeng, formerly of the Shanxi Dragons and now with Sichuan Blue Whale. Yang, who cut his teeth as a player in the days prior to Chinese basketball professionalizing, runs one of the most nakedly pro-western offenses in China. His system relies on a one-two punch of foreign players using either their outside shooting or low post bulk to gain most of the team’s points. With defenses inclined to shift to towards the foreigners, local guards suddenly become wide open scoring options and everyone gets to enjoy the party on offense. This off-season, Yang chased both NBA free agents Nate Robinson and Carlos Boozer in his quest to find another inside-outside partnership, albeit without success. So instead, Yang turned elsewhere and brought in all three of Qingdao’s foreigners from their historic season last year (the Eagles, prior to 2014/15 had never made the postseason, let alone the semi-finals). It was a shameless move but it also made sense. Haddadi was a natural fit as Yang’s big man, Justin Dentmon was a 44% shooter from downtown and could pull up from the car park, whilst the veteran Mike Harris has been in China since 2007 and can play both the 3 and the 4. But the other critical aspect for Yang are the rules governing foreigners in the fourth quarter. Since last season, only one American can be on the court in the final twelve minutes. The catch, however, is that the third foreigner (ie. an non-Chinese Asian import) is not covered under those rules and can play the entire game if need be. Moreover, there are only five teams in the league allowed a third import– those who finished in the bottom five from the previous year. This opens up a new aspect to the league and makes having an ‘third foreigner’ who can score extremely important. 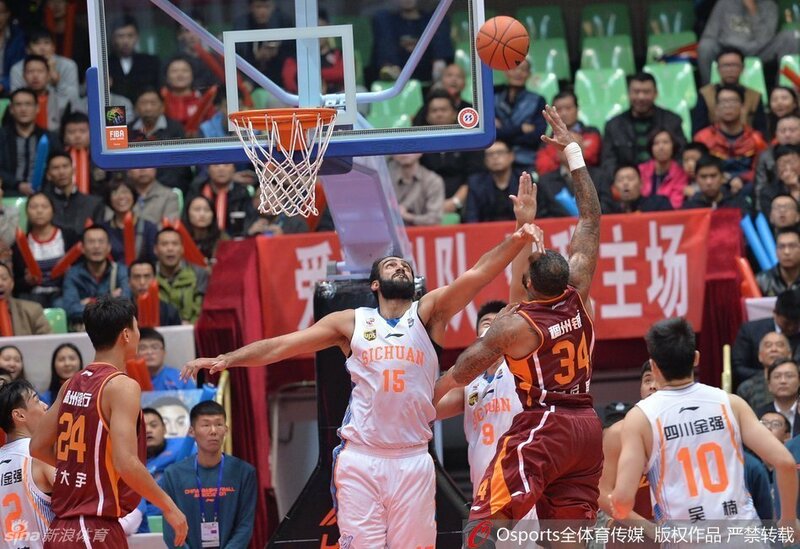 Sichuan have Haddadi, Fujian have veteran Lebanese swingman Fadi El-Khatib and suddenly both teams have an edge in the fourth quarter. This is a new edge to China’s relationship with overseas players. In the past, the Asian import has been a defensive player, often a rebounder like Zaid Abbas or Arselan Kazemi. But now teams are realizing they can get an edge by bringing in Middle Eastern players (FIBA brackets those players as Asian) who can shoot. As a result, we’re suddenly seeing guys like El-Khatib get huge minutes but also Nikkah Bahrami (Zhejiang) and Mahdi Kamrani (Beijing Dragons). Tellingly, neither Abbas nor Kazemi have a deal this year. However, Haddadi is the pick of the bunch and was the reason Sichuan signed him very early on in the offseason. The center is a busy two-way player that can bang, clean up the glass and alternate between being the lead scorer and a playmaker (he has legit passing skills for a guy his size). Critically, he can also play as long as he wants to. So now the league’s attempts at stopping the top teams using their Americans too much have given a massive advantage to the bottom feeders and Yang was smart enough to sense this. Perhaps he had to learn the hard way given that the coach employed the more defensive Abbas at Shanxi last year and ran out of steam in the postseason, fittingly against Qingdao. As a result, Yang now has equipped himself with as many legal weapons as possible in Sichuan. In practice, Harris plays two quarters and sits out the fourth, leaving Dentmon and Haddadi to run Yang’s original system undisturbed. Few other coaches have such an advantage given that their playbook works for three quarters and then often dissolves into hero ball for the final twelve minutes because they can only play one American. Now this is early days but Sichuan’s offseason moves could be a real game changer for recovering teams. If they finish low enough, they can get their third overseas player that compliments the coach’s playbook and help them close out games. Last year, three of the five teams with a third foreigner went to the postseason (Qingdao, Shanxi and Jilin) and this trend could continue this year with Sichuan, Beijing Dragons and Fujian all enjoying decent-to-good starts. What’s more, Sichuan, who can roll out three foreigners and has a solid supporting cast of shooters like Wu Nan and Meng Da, could be a Finals team. Haddadi, though, is the key. If he remains this impactful thought out the year, the third foreigner rule may well become the biggest wildcard factor in Chinese basketball history.